Scotland, UK — EDF Energy Renewables, one of the foremost UK renewable development companies, has successfully deployed wind lidar technology provided by UK firm ZephIR Lidar, to optimise site performance at the 144 MW Fallago Rig Wind Farm in Scotland. The lidar, a ZephIR DM capable of wind measurements in advance of the turbine, was deployed by EDF ER Asset Management and O&M teams in less than 8 hours and was fully operational in just minutes measuring wind data out to 300 metres in advance of the wind turbine. The measurement campaign will last approximately 12 weeks on the Vestas turbine in order to collect a wide range of wind conditions across a seasonal period before moving on to the next turbine. The methodology further allows both Asset Management and O&M teams to direct their focus on areas for optimisation in a faster, more focussed approach than using SCADA data alone. 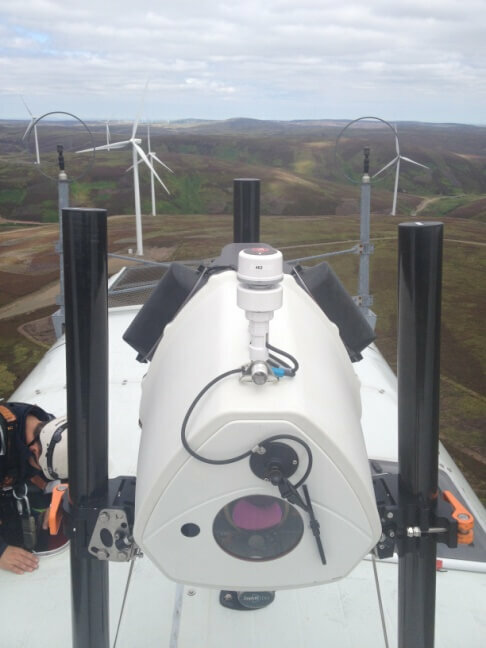 EDF ER has also deployed ground based lidar ZephIR 300 at Rhodders Wind Farm in place of traditional mast anemometry. In this application ZephIR 300 provides a low visual impact, safer approach to wind resource assessment measuring higher, faster and to a greater level of wind detail than currently possible with meteorological towers. ZephIR 300 is an accurate, robust and cost-effective lidar with the longest service period (3 years) of any comparable device. The first remote sensor to achieve DNV GL Stage 3 acceptance for use with no additional met masts, combined with excellent classification results ensure the device is completely fit for purpose in the maturing lidar market. ZephIR DM delivers high-resolution, full rotor scanning capability unparalleled by any other turbine-mounted lidar. Its ability to take slices of data across the full rotor, combined with the on-board motion recognition system, make measurements within +/-1% of hub height a possibility. This provides a measurement equivalent with the requirements stipulated within the draft revision of the IEC Standard for Power Performance measurements (IEC 61400-12-1).